Copper color. Aromas of sherry, madeira cake, anise, wet tobacco, sea salt on molasses-glazed nuts, garlic scapes, and salami with a round, bright, dry-yet-fruity medium body and a seamless, breezy menthol, cedar, pretzels, and roasted chile finish. 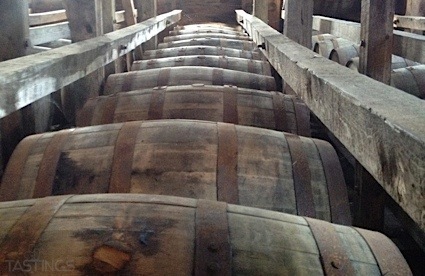 A voluptuous American Single Malt that offers a roller coaster ride of a new-world take on sherry-finished styles. Bottom Line: A voluptuous American Single Malt that offers a roller coaster ride of a new-world take on sherry-finished styles. 88 • Battle Cry Single Malt Whiskey Finished in Oloroso Sherry Barrels 46% (USA) $29.99. 84 • Battle Cry American Single Malt Whiskey 46% (USA) $49.99. 85 • Loyal 9 Apple Cider Cocktail RTD 9% (USA) $11.99. 87 • Sons of Liberty Saison Ale Spirit 46% (USA) $44.99. 92 • True Born Gin - The Belgian Wheat Act 45% (USA) $35.00. 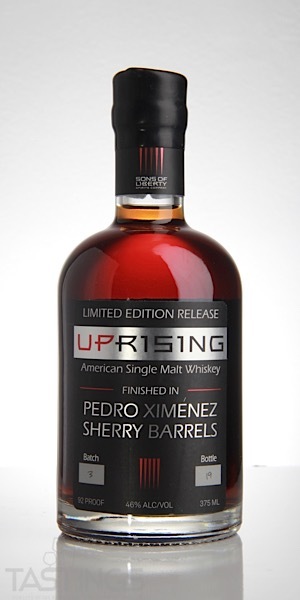 86 • Uprising Pedro Ximénez Finished American Single Malt Whiskey 46% (USA) $29.99. Uprising Pedro Ximénez Finished American Single Malt Whiskey rating was calculated by tastings.com to be 86 points out of 100 on 10/25/2018. Please note that MSRP may have changed since the date of our review.